Draft: 2009, Arizona Diamondbacks, 8th rd. He and his wife, Amy, have a son, Jacob, and daughter, Emma...Met his future wife, who was on the golf team, in an athlete study hall during freshman years while at Texas State University...Has a golden retriever named Brinkley...The Goldschmidt family is from Germany…his greatgrandmother, Ilse, an heiress to one of the largest printing companies in Germany, her husband, Paul, and their 5-year-old son, Ernie, fled the Nazis for Boston in 1938...Was born in Wilmington, Del. but moved to Texas before he was one year old...Grew up a fan of the Astros' Jeff Bagwell & Craig Biggio...As a high school senior, was seated in the center field upper deck at Minute Maid Park when Albert Pujols hit the famous home run off Astros closer Brad Lidge to launch the Cardinals to a dramatic comeback victory in Game 5 of the 2005 National League Championship Series...Graduated from The Woodlands (Tex.) High School in 2006...Did not start on the baseball team until his junior year...Played third base as a senior in 2006 as the Highlanders (38-1 record) won the Class 5A Texas state baseball championship and were crowned National Champions by Baseball America, USA Today, and Collegiate Baseball...Originally selected by Los Angeles (NL) in the 49th round of the June, 2006 First-Year Player Draft, but did not sign to attend Texas State University...The Dodgers expected Goldschmidt to opt for college, but selected him anyway because he was highly recommended by then Dodgers scout Chris Smith, whose son was a high school teammate of Goldschmidt...Also was high school teammates of pitcher/shortstop Kyle Drabek, who was selected by Philadelphia in the first round (18th overall) that year...Played three seasons at Texas State University (2007-09), where left as the school's all-time leader in home runs (36) and RBI (178)...His No. 37 was retired in Feb. 2015, becoming the first Texas State baseball player to have his jersey retired and just the fifth across all sports at the university...As a sophomore in 2008, faced off against fellow Houston native Matt Carpenter (red-shirt junior) and Texas Christian University twice...As a junior in 2009, helped lead the Bobcats to the Southland Conference championship that included a record 41 wins...Won back-to-back Southland Conference Hitter of the Year titles (2008-09)...Named 2009 All-SC Player of the Year after breaking school records with 18 homers and NCAA Division I-leading 87 RBI...Two-time SC Scholar Athlete of the Year (2008-09) and tabbed as Texas State's 2009 male Student Athlete of the Year after making the dean's list every semester he was enrolled...Boasted a 3.87 GPA in Finance through his junior year at Texas State, and was 10 hours short from securing his degree when signing with Arizona...Played for the Anchorage Bucs in 2008 Alaska Baseball League where he was an All-League Selection at Designated Hitter...Selected by Arizona in the 8th round of the June, 2009 First-Year Player Draft To honor both himself and to fulfill a promise to his family, graduated from the University of Phoenix with a bachelor's of science degree in Management in 2013, the season where he finished second in the NL Most Valuable Player voting...Took 10 classes to earn his diploma, completing his classwork on team flights and at the hotel while on the road throughout his first two full Major League seasons...He and his wife began volunteering at Phoenix Children's Hospital during the winter of 2011, and later received permanent visitors' credentials due to visting so frequently...He and his wife started the Goldy's Fund 4 Kids (GF4K) charity in 2014...It's mission is to help Phoenix Children's Hospital patients and their families through hands-on volunteering, time together, and providing tangible products to help patients stay positive and get healthy during their stay...Teamed with the Arizona Diamondbacks Foundation and raised money to benefit Phoenix Children's Hospital through his Goldy's Fund 4 Kids, launching a "Bleacher Creature" program (2014) and hosting "Goldy's Bowling Bash" (2016 and 2018)...On April 4, 2017, the Arizona Diamondbacks Foundation dedicated Paul Goldschmidt Field, the 39th field in the "Diamonds Back" Youth Field Building Program. Located at Falcon Park in nearby Goodyear, the field received a new scoreboard, fencing, windscreen, sports lighting system and fixtures, irrigation system, sod, stabilizer and other general field updates...In 2017, surprised a second grade class at Edison Elementary School in Phoenix for National Teacher Appreciation Day...In 2018, he and his wife were named honorary chairs for the Hope Lives Here capital campaign to raise funds for the building of the new Center for Cancer and Blood Disorders at Phoenix Children's Hospital...In 2018, chaired events for Chrysalis, a non-profit domestic violence shelter; and assisted Soldier's Best Friend, a local non-profit that pairs veterans with adopted animals and then certifies them as a service animal...Traveled to Australia and New Zealand on a goodwill tour with Diamondbacks officials in November 2013, in advance of the 2014 Opening Series in Sydney...Cites Lyle Overbay as one of the most influential players in his career (Paul made his debut on 8/1/11 and Overbay signed on 8/13/11)…helped him on defense and positioning. Hit .290 (172-593)/.389 OBP/.533 SLG with 35 doubles, a career-high five triples, 33 home runs, 83 RBI and a .922 OPS in 158 games in his eighth season with the Diamondbacks...Won his second consecutive Silver Slugger award at first base and finished sixth in the voting for the National League MVP award. • Made franchise record sixth All-Star appearance (2013-18), surpassing the five by Luis Gonzalez and Randy Johnson… he is the only NL player to make each of the last six All-Star teams, and one of only three players in the Majors to do so (Mike Trout and Salvador Perez)...Was the Diamondbacks' nominee for MLB's Roberto Clemente Award, Hank Aaron Award, and the MLBPA Heart and Hustle Award. • Recognized as the First Baseman the on Arizona Diamondbacks 20th Anniversary Team...Rated as the NL's "Best Defensive First Baseman" and "Best Hitter" (No. 3) in Baseball America 's Best Tools Survey following the season...Extended his franchise record by recording his fourth season with 30 or more homers...Notched his fourth season with at least 30 home runs and a .900 OPS, becoming one of seven active players: Albert Pujols (11), Miguel Cabrera (8), Mike Trout (5), Ryan Braun (5), Edwin Encarnación (4) and José Bautista (4)...Ranked among NL leaders in OPS (3rd), times on base (3rd, .268), game-winning RBI (T-5th, 13), on-base pct. (6th), extra-base hits (6th, 73), walks (6th, 90), slugging pct. (7th), runs scored (9th, 95) and go-ahead RBI (T-10th, 23)...While batting No. 2 in the Arizona lineup in a career-high 47 games, hit .349 (67-192) with 17 home runs, 40 RBI and a 1.104 OPS...Thirteen of his 33 home runs came in the first inning, marking his single-season career-best and tying Nolan Arenado and Jose Ramírez for the Major League lead...In his final 110 games to end the season (after 5/22), hit .328 (138-421)/1.023 OPS with 27 doubles, 28 home runs, 70 RBI and 62 walks (was hitting .198 on 5/22)...Finished 8th in the Majors in OPS (.922) after ranking 128th (.625) on 5/22...Was the first player in the liveball era (since 1920) to increase their average to .300 or higher in a season in which it was under .200 at some point after 200 plate appearances ( Elias )...On the road, led the NL with a career-high .339 average (104-307), ranking T2nd with a career-high 21 home runs (Javier Báez) and T4th with 51 RBI (Matt Carpenter and Yadier Molina)...Totaled three multi-homer games during the season and reached 15 for his career, 3rd-most in team history behind Luis Gonzalez (21) and Steve Finley (16). Recorded backto-back multi-homer games for the first time (6/8-6/9) at Colorado...Tied for 9th in the NL with 3+ hit games (14) and T8th for 4+ hit games (3). Established a club record with 14 career four-hit games...Led NL first basemen with a career-high 131 double plays, 1,323 putouts and 1,439 total chances...Made his seventh Opening Day start at first base, extending his club record. His seven Opening Day starts are 2nd-most in club history behind Luis Gonzalez (8)...Named NL Player of the Month for June, his first monthly award. Ranked among NL June leaders in average (1st, .364), home runs (T-1st, 10), OPS (2nd, 1.199), RBI (T-2nd, 23), on-base pct (3rd, .460) and slugging pct. (3rd, .738)...Named NL Player of the Week for June 4-10 period, hitting .640 AVG/.690 OBP/1.440 SLG with four home runs, one triple, six doubles, 11 RBI and a 2.130 OPS...Tied his career high with three doubles (3rd time) and four hits (12th time) at San Francisco (6/6)... Established a Diamondbacks record with four consecutive games (6/5-6/9) of three or more hits, and club-record-tying back-to-back two-homer games from (6/8-6/9)...Produced a streak in four straight games (6/6-6/10) with two or more extra-base hits and two or more RBI, tying a Major League record (since 1920) shared by Frank Howard (5/12-5/16/68), Frank Robinson (9/19-9/22/66), Vic Wertz (7/28-8/1/50) and Chet Laabs (7/15-7/17/42) ( ESPN )...Joined Lou Gehrig (6/16-6/19/36) as the only two players (since 1913) to accumulate 11+ extra-base hits and 15+ hits over a five-game span (6/5-6/10): 11 extra-base hits and 15 hits...Tied a career high (third time) with five consecutive multi-hit games (6/5-6/10)...Reached base safely in a club-record 48 straight road games (.397; 73-184) from 5/27-9/12. Also reached base safely in a season-high 27 games in a row from 7/23-8/22...Clubbed his 200th career home run (8/3) off San Francisco's Chris Stratton, almost seven years after his first homer (8/2/11)..Set a club record by reaching base safely in 10 consecutive plate appearances (8/17-8/19), all at San Diego...Hit his seventh home run (third career) in franchise history to tie the game with the team down to their final strike (2 strikes + 2 outs) on 9/6 vs. Atlanta...Set the Chase Field home run record (96) on 8/22 vs. Angels (Odrisamer Despaigne), surpassing Luis Gonzalez. Finished third in National League Most Valuable Player voting (239 points), behind Giancarlo Stanton (302) and Joey Votto (300)...Won his third Rawlings Gold Glove Award® and third Louisville Slugger® Silver Slugger Award™...Named a NL All-Star for the fifth consecutive season, the first player in team history to be selected to 5 straight All-Star Games, and tied for the most overall appearances (also: Luis Gonzalez and Randy Johnson)...Hit .297/.404 OBP/.563 SLG (166-for-558) with 34 doubles, 3 triples, a career-high-tying 36 home runs and 120 RBI in 155 games...also set career highs in runs (117), extra-base hits (73), at-bats to home run ratio (15.50) and at-bats to RBI ratio (4.65)...Ranked among the NL leaders in most offensive categories, including: runs (3rd), RBI (4th), walks (4th), extra-base hits (4th), on-base pct. (5th), OPS (5th, .966), go-ahead RBI (T-5th, 29) and total bases (6th, 314)...also was seventh in the Majors with a .365 average with RISP (58-for-159). POSTSEASON: Batted .188/.235 OBP/.563 SLG with 2 home runs and 5 RBI in 4 games. Hit .297 (172-for-579) with 33 doubles, 24 home runs, 95 RBI and 32 stolen bases in 158 games...Named a NL All-Star for the fourth consecutive season, joining Randy Johnson (1999-2002) as the only D-backs to receive the honor 4 seasons in a row...Led NL in walks (110), ranked third in on-base pct. (.411), and stolen base pct. (86.5), seventh in steals and 10th in OPS (.899)...Ranks among the D-backs all-time leaders in most offensive categories, including: RBI (2nd, 507), walks (2nd), extra-base hits (2nd, 349), doubles (T-2nd, 198), hits (3rd, 844), stolen bases (3rd, 99) and home runs (3rd, 140)...Named the D-backs' nominee for the 2016 Roberto Clemente Award for the fourth straight season...Named by Baseball America as the NL's Best Defensive First Baseman and second Best Hitter (Daniel Murphy)…named to Sporting News' "Baseball 50," a list of today's best players...Is 1 of 4 D-backs with at least 4 seasons of 20+ home runs, join-ing Luis Gonzalez (6), Steve Finley (5) and Chris Young (4)...Was the fourth player in team history with 20+ homers and 30+ stolen bases in the same season: Jean Segura (2016), A.J. Pol-lock (2015) and Eric Byrnes (2007)...Reached base safely in 137 games, the second-highest total in the NL (Joey Votto, 138)...His 34 steals were the fourth most by a first baseman since 1974, and the most since Gregg Jefferies in 1993 (46)...He was the second first baseman to record 20+ homers and 30+ stolen bases in a single season, joining Jeff Bagwell (1997)...Joined Segura as the sixth set of teammates in Major League history to each have 20+ homers and 30+ stolen bases in a season: Blue Jays' Jose Cruz and Raul Mondesi in 2001, Astros' Craig Biggio and Bagwell in 1997, Rockies' Ellis Burks and Dante Bichette in 1996, Mets' Howard Johnson and Darryl Strawberry in 1987 and Pirates' Barry Bonds and Andy Van Slyke in 1987...Was the third first baseman since the 1974 season to record 20+ homers and 20+ stolen bases in consecutive seasons (Bag-well, 1996-97; Klesko, 2000-01) and the third overall in team history (Byrnes. 2006-07; Chris Young 2010-11)...Hit .306 (151-for-494) with 31 doubles, 2 triples, 18 homers and 79 RBI in 133 games from May-end of the season...Led the Majors in total chances (1,498) and putouts (1,378)...Ranked second among NL first basemen in assists (116), third in fielding pct. (.997) and tied for fifth in defensive runs saved (4)...Made his fifth Opening Day start at first base, extending his club record...Received the 2015 BBWAA Houston Area Player of the Year Award prior to the game on June 1 @ Astros…also won in 2013...Ended the season with 18 consecutive successful stolen base attempts, tied with Chris Owings (Aug. 21, 2015-Aug. 28, 2016) for the second longest streak in club history (Byrnes, 30 from July 7-Sept. 11, 2007)...Recorded his sixth walk-off plate appearance and fourth walk-off home run of his career Aug. 22 vs. Braves…tied with Gonza-lez for the second-most walk-off homers in team history, trail-ing only C. Young (5)...Reached base safely in 50 consecutive games vs. Rockies from July 5, 2013-Sept. 3. 2016, the longest streak all-time by an op-ponent vs. Colorado…was 1 of 5 players in the divisional era (since 1969) to compile an on-base streak of 50+ games vs. a single opponent, joining Bonds (72 games vs. Reds from 1996-2007; 54 games vs. D-backs from 2002-2006), Dave Parker (56 games vs. Cubs from 1977-1980) and Todd Helton (51 games vs. Padres from 2002-2005)...Recorded his 500th career RBI on Sept. 23 @ Padres...Set a career high with 3 stolen bases on Oct. 1 vs. Padres…was the sixth MLB first baseman since 1990 to steal 3+ stolen bases in a single game and the first since Padres' Klesko on May 24, 2001 vs. Arizona. Set career highs in average (.321), on-base pct. (.435), slugging pct. (.570), OPS (1.005), stolen bases (21) and walks (118)…tied his career bests in runs scored (103) and hits (182), while falling 1 game shy of matching his most (160 in 2013)…Finished second in the NL Most Valuable Player voting to Washington's Bryce Harper…Became the first D-back to be elected to start multiple All-Star Games (also 2014 at Target Field) and 1 of 4 D-backs to participate in 3+ Midsummer Classics, joining Luis Gonzalez (5), Randy Johnson (5) and Brandon Webb (3)…his 9,119,375 votes broke his own D-backs record from 2014 (3,566,216)…Received his second Louisville Slugger Silver Slugger and Rawlings Gold Glove at first base (also: 2013)…also selected to The Sporting News NL All-Star Team…Named the club's MVP by the Arizona chapter of the BBWAA and the winner of the inaugural Luis Gonzalez Award, along with the D-backs' recipient of the Roberto Clemente and the MLBPAA Heart and Hustle Award…Established single-season team records with a .435 on-base pct., 118 walks and 29 intentional walks…finished second with a .570 slugging pct. and a 1.005 OPS…Is 1 of 5 D-backs with at least 3 seasons with 20+ home runs (also Gonzalez, Steve Finley, Chris Young and Mark Reynolds)…Is the second player in club history with multiple 100-RBI seasons (also Gonzalez)…also joined Gonzalez (2001) as the only 2 D-backs with 100 walk/100 RBI seasons, and was the first NL player to do so since Joey Votto and Prince Fielder in 2011…Is 1 of 7 D-backs with a 20 stolen base/20 homer season: Eric Byrnes (2006-07), Reynolds (2009), Justin Upton (2009, '11), Devon White (1998), Young (2011) and A.J. Pollock (2015)… prior to Goldschmidt, the last first baseman to accomplish feat was Florida's Derrek Lee in 2003 (21 SB/31 HR)…Moved from ninth place on the club's all-time home run list to fifth, passing Jay Bell (91), Miguel Montero (97), Matt Williams (99) and Upton (108)…also jumped from 11th place on the RBI list to fourth…Was the first player with 100+ walks, runs scored and RBI with a .320 average or better since Miguel Cabrera in 2011 and first in the NL since Albert Pujols in 2009… Ranked among NL leaders in OPS (2nd), RBI (2nd), times on base (2nd, 302), average (3rd), on-base pct. (3rd), slugging pct. (3rd), runs scored (3rd), walks (3rd), hits (3rd), total bases (3rd, 323), pitches per plate appearance (5th, 4.20), home runs (5th) and extra-base hits (5th, 73)…Led all first basemen with 18 defensive runs saved…Tied for second in the NL with 20 home runs on the road (also: Cubs' Anthony Rizzo)…the 20 road homers tied for the third most by a D-back (also Gonzalez in 2003)…His .341 average (90-for-264) at home was the fourth best in club history…16 home runs vs. NL West foes was second most in club history, trailing only Upton's 17 in 2011…Led all first basemen with 1,378 putouts and 1,505 total chances…the 1,505 TC were the most in the Majors since Pujols in 2010 (1,619)…His .9966 fielding percentage was third among NL first basemen, percentage points behind Brandon Belt (.99735) and Lucas Duda (.99731)…Made his club record fourth Opening Day start at first base…On April 11, became the first D-back to homer in 4 consecutive games vs. Dodgers…Achieved his sixth career multi-homer game on May 30 at Brewers…was the first D-back to homer off the same pitcher (Kyle Lohse) in consecutive innings since Aaron Hill on April 7, 2012 vs. Giants (Madison Bumgarner)… Accumulated 21 total bases during a 3-game series from May 29-31 @ Brewers, the third-highest total during a 3-game set in club history behind Steve Finley (27 from Sept. 7-9, 1999 at Brewers) and Aaron Hill (22 from June 18-20, 2012 vs. Mariners)…Became the first player in MLB history with 3 hits and 3 intentional walks in a single game on May 31 at Brewers…also set a club record by reaching base safely 7 times, and was the first D-back to be intentionally walked 3 times in a game, and first NL player with 3 IBB since the Cardinals' Pujols on Aug. 26, 2010 at Nationals…Hit his 100th career homer on June 10 @ Dodgers…Hit a 471-foot home run on Aug. 26 vs. Cardinals, the longest of his career (distance provided by Statcast)…Homered in 4 straight games at Dodger Stadium from June 10- Sept. 23, tying a club record (also: Chad Tracy in 2005). Hit .300 (122-for-406) with 39 doubles, 19 home runs and 69 RBI in 109 games with Arizona before suffering a season-ending hand injury on Aug. 1 vs. Pirates... Elected as the NL starting first baseman (second All-Star Game), the fourth fan-elected starter in club history (Jay Bell and Matt Williams in 1999 and Luis Gonzalez in 2001)... Received 3,516,890 votes, ahead of the Dodgers' Adrian Gonzalez (1,888,648) and Cardinals' Matt Adams (1,746,904)…was in fifth place in the initial balloting figures on May 28, and accumulated 2,732,864 votes over the last 4 updates, when he was second with 784,026...Was the second D-back to hit .300 in back-to-back seasons, joining Luis Gonzalez from 1999-2003 (min. 450 PA)...Entered game on Aug. 1 vs. Pirates as a pinch-hitter and was hit by an Ernesto Frieri pitch and was diagnosed with a fractured left hand... At the time of his disabled list placement on Aug. 2, ranked among NL leaders in doubles (1st), extra-base hits (1st, 59), total bases (2nd, 220), runs scored (T-2nd, 75), on-base percentage (3rd, .396), slugging percentage (3rd, .542), walks (3rd, 64), RBI (3rd), OPS (4th, .938), average (5th), hits (6th) and home runs (T-7th)... Finished fourth in the NL in offensive WAR with 32.7 [source: fangraphs.com; min. 450 PA]... Led the Majors by reaching base 4 times via catcher's interference... Set a club record with 36 doubles prior to the All-Star Break, the most in the NL in the first half since the Brewers' Lyle Overbay's 37 in 2004... Joined Danny Bautista (2002) as the only 2 D-backs to boast multihit efforts in each of the club's first 4 games (no one has accomplished in first 5)...His 26-game hitting streak from Sept. 10, 2013-April 5 was the second-longest in team history (.394, 41-for-104)…his streak of reaching base safely in 31 straight games from Sept. 10, 2013-April 10 tied for fifth-longest by a D-back... Club-record 40 hits in March/April were the most by a NL player since 2011 (41 by Andre Ethier and Placido Polanco; 40 by Starlin Castro)... Fifth career multi-homer game with a career-high 6 RBI on May 17 vs. Dodgers…also established a club record with 5 runs scored…since 1960, was the fifth player with at least 4 extra-base hits, 6 RBI, and 5 runs scored in a game: Willie Stargell on Aug. 1, 1970 @ Braves, Jeff Cirillo on June 28, 2000 vs. Giants, Shawn Green on May 23, 2002 @ Brewers and Alex Rodriguez on April 18, 2005 vs. Tampa Bay [source: Elias Sports Bureau]... Started 59 consecutive games at first base from March 22-June 1, 1 shy of tying Travis Lee's club record (60 from May 17-July 24, 1998)... Hit his first home run into the RamTrucks.com Pool on June 10 vs. Astros... 28 walks in June tied a club record for a month (also: Goldschmidt in Aug. 2013)... Reached base safely in a career-high 32-straight games from June 7-July 12, the fourth-longest streak in club history... Collected his 300th RBI on July 27 @ Phillies... Led the Major Leagues with a .446 OBP and 43 walks from June 7 until his injury on Aug. 1... Delivered a 10th-inning, walk-off double on July 9 vs. Marlins...Along with wife Amy, presented 3 full-tuition scholarships to the University of Phoenix in a pregame ceremony on Sept. 14...Named the D-backs' nominee for the following awards: Hank Aaron, Roberto Clemente, Marvin Miller Man of the Year; Heart and Hustle and Branch Rickey... Received the 2013 BBWAA Houston Area Major League Player of the Year award in a pregame ceremony on June 11 @ Astros. Finished second in the NL Most Valuable Player voting after hitting .302 (182-for-602) with 36 doubles, 36 home runs, 125 RBI, 99 walks and 103 runs scored in his second full season with the D-backs…his fi nish was the best by a D-back in club history, ahead of Matt Williams (1999) and Luis Gonzalez's (2001) third-place results... Won the NL Hank Aaron Award (league's top offensive performer) and Mel Ott Award (league home run leader), received his fi rst Silver Slugger® and Rawlings® Gold Glove Award at first base, and was selected as the club's MVP by the Arizona chapter of the BBWAA... Joined Andruw Jones (2005) and Matt Kemp (2011) as the only 3 NL players to win both the league's top offensive accolade and defensive honor... Selected to his first NL All-Star Game, going 1-for-2 with a double... Became the 19th player since 1977 to tie/lead the NL in home runs and RBI and ninth to also hit .300 or above... Finished among the D-backs' all-time, single-season leaders in numerous offensive categories, including OPS (2nd, .952), walks (2nd), home runs (3rd), RBI (3rd), games (T-3rd), OBP (4th, .401), slugging pct. (4th, .551), hits (6th) and runs scored (T-8th)... Established club records for first basemen in home runs, walks, runs scored and RBI... Sixth D-back with 30 homers and 100 RBI, joining Steve Finley (1999), Williams (1999), Jay Bell (1999), Gonzalez (2000-01) and Mark Reynolds (2009)... Is 1 of 3 NL players to boast a .300 average, 35 home runs, 100 RBI, 100 runs scored and 99 walks during their 25-year-old season or earlier (also Mel Ott in 1929 and '32 and Eddie Mathews in 1953)... Ranked among NL leaders in slugging pct. (1st), OPS (1st), extra-base hits (1st, 75), RBI (1st), total bases (1st, 332), home runs (T-1st), walks (3rd), runs scored (T-3rd), OBP (4th) and doubles (T-10th)... Led the NL in walk-off home runs (3), home runs after the eighth inning (7), go-ahead homers (20) and go-ahead RBI (37)…also tied for the NL lead in game-winning RBI (19) and RBI with runners in scoring position (84)... Ranked second in the NL with a .997 fielding percentage, trailing only Todd Helton (.998)…according to fangraphs.com, led the Majors with 74 "scoops" at first base... Accounted for 19.3 percent of the D-backs' RBI and 27.7 percent of home runs, both tops in the Majors... Became the first player in club history with 3 grand slams in a season (June 1 @ Cubs, June 5 @ Cardinals and Aug. 20 @ Reds)... 77 first-half RBI were the third-most by a D-backs player, trailing Gonzalez (86 in 2001) and Williams (82 in 1999)... Homered in 3 straight games for the first time (4 total) from May 7-9, including his fi rst multi-homer effort on May 8 @ Dodgers…also tied a club record with 3 straight 3-RBI games from May 7-9, joining Reynolds (April 6-8, 2008) and Finley (June 1-4, 1999)... Tied for NL lead with 15 second-half home runs and tied for third with 48 RBI... Notched 3 extra-base hits in back-to-back games on May 15-17, only the second D-backs player to do so (also Finley on Sept. 7-8, 1999 @ Brewers)... Went 4-for-5 with a double, 2 home runs, 4 RBI and 4 runs scored on May 17 @ Marlins…tied a franchise record with 4 runs (18th time)... 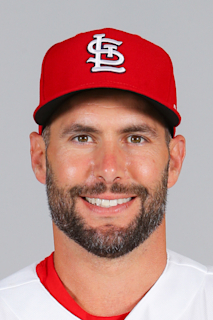 Became the first D-backs player to hit 2 grand slams on a road trip ( June 1 @ Cubs and June 5 @ Cardinals)…his slam on June 1 was the fi rst by a D-back to give the team the lead on the road in the 8th inning or later since Chad Tracy on July 8, 2006 @ Rockies... Recorded a RBI in a career-high 8 straight games (17 RBI total) from June 1-8, tying Gonzalez's club record (June 3-11, 2002)... Hit fi rst walk-off home run on June 18 vs. Marlins (off Chad Qualls)... His 457-foot home run on June 21 vs. Reds was the longest of his career (source: ESPN Sports & Info Group) and a team-best for 2013... Scored a run in 8 straight games from Sept. 13-20. Hit .286 (147-for-514) with 43 doubles, 20 home runsand 82 RBI in 145 games in his first full Major Leagueseason with the D-backs...Is 1 of 6 players in club history with at least 40 doublesand part of 3 pairs of teammates (Aaron Hill) to accomplish the feat (Stephen Drew and Chris Young in 2008and Luis Gonzalez and Chad Tracy in 2006)...Is the only first baseman in club history with at least 10homers and 10 stolen bases in a season (stats as 1B only)...Ranked fourth in the NL in doubles and tied for sixthwith an 85.7 (18-for-21) stolen base percentage...Among NL first basemen, finished second in average(.290), doubles (43), third in slugging percentage (.497)and hits (147) and fourth in home runs (20) and RBI(81)...statistics as 1B only...His.497 slugging percentage and 43 doubles were a clubrecord by a first baseman, while his 81 RBI trailed onlyAdam LaRoche's 100 in 2010...Hit .343 (59-for-172) with 10 home runs vs. left-handedpitchers, ninth-best in the NL...10 home runs also tiedfor 10th in the NL...Batted .303 (125-for-413) after starting the season hitting.218 (19-for-87) in his first 27 games...Hit first Opening Day home run on April 6 vs. Giants...Launched a 471-foot home run on May 27 vs. Brewers,the longest at Chase Field in 2012...Notched an extra-base hit in 7 straight games from May30-June 8, tied for the second-longest streak in club history (also Chad Tracy from Sept. 17-24, 2005 and MattWilliams from June 6-13, 1999)...Career-high 17-game hitting streak (.419, 26-for-62) fromMay 19-June 10...Hit .341 (28-for-82) in June, tied for eighth-best in theNL with teammate Willie Bloomquist...also tied forfourth with 9 doubles...Hit the longest homer in 2012 by an opponent in BuschStadium on Aug. 15 (456 ft.). Spent the majority of the season with Double-A Mobile but made 48 appearances with the D-backs and hit .250 (39-for-156) with 9 doubles, 8 home runs and 26 RBI...Named USA Today's Minor League Player of the Year, batting .306 (112-for-366) with 30 homers and 94 RBI in 103 games with the BayBears...joined Justin Upton (2007) as the lone D-backs to earn the honor...also selected to Baseball America's Minor League All-Star Team and named the Southern League Most Valuable Player...Played in the MLB All-Star Futures Game at Chase Fieldand SL midseason All-Star Game...Garnered SL Player of the Week honors for April 7-17...His contract was selected on Aug. 1...led all MinorLeaguers in home runs and RBI and ranked second with 82 walks at the time of his promotion...Played in 43 games (41 starts) at first base with the D-backs and did not commit an error (373 TC)...was one of 2 players in baseball to have a 1.000 fielding percentage (min. 40 G) at first (also Nationals' Adam LaRoche)...Made his Major League debut and recorded his first hiton Aug. 1 @ Giants (single off Matt Cain)...According to Elias Sports Bureau, became the 17th player in club history to get a hit in his first plate appearance...Reached base safely in his first 10 games from Aug. 1-12, the second-longest streak in club history to start his career behind Gerardo Parra's 17-game in 2009 (Elias)...Hit his first home run on Aug. 2 @ Giants (off TimLincecum)...Hit a go-ahead, 2-run triple to break a 1-1 tie in the eighth inning on Sept. 23 vs. Giants in the 3-1 NL West division-clinching game...Named by Baseball America as the No. 3 Prospect in the SL following the season...POSTSEASON: Batted .438 (7-for-16) with 2 home runs and 6 RBI in the NLDS vs. Milwaukee...homered in his first two postseason games, the second rookie in baseball history to accomplish the feat (Yankees' Shane Spencer in 1998 ALDS vs. Rangers)...his grand slam in Game 3, the first in D-backs postseason history, was the third by a rookie in playoff history (also Yankees' Ricky Ledee in Game 4 of the 1999 ALCS and Yankee's Gil McDougald in Game 5 of the 1951 World Series). Named the D-backs' organizational Player of the Year, California League Most Valuable Player and league Rookie of the Year after leading the league with 35 home runs, 42 doubles, 80 extra-base hits, 318 total bases and a .606 sluggingpercentage while ranking second with 108 RBI and fifth with 165 hits....was also named to the league's postseasonAll-Star team...His 35 homers tied for third among all minor league batters, while his 108 RBI ranked sixth...Garnered league Player of the Week honors from May 10-16 and July 5-11...also named the organization's Player ofthe Month for May after batting .336 with 20 runs scored, 10 doubles, a triple, 7 home runs and 19 RBI in 31 games...Went 5-for-5 with 4 runs scored and 3 doubles on May 28 vs. Rancho Cucamonga...Hit .339 (39-for-115) with 8 doubles, 12 home runs and 30 RBI in July...Plated a career-high-tying 6 RBI on July 24 vs. Stockton. Batted .334 with 18 home runs and 62 RBI in 74 games at Rookie Missoula during his first professional season...led the Pioneer League in home runs and slugging percentage (.638)...Led the organization's short-season clubs in average, games played, runs, hits, total bases (183), doubles and homeruns...Went 2-for-5 with a home run in his professional debut on June 23 @ Helena...Named the league's Player of the Week for Aug. 3-9...Hit 2 home runs in back-to-back games on Aug. 11 and 12, combining for 6 RBI in those games...Collected a season-high 4 hits on two occasions; Aug. 3 vs. Helena and Sept. 11 @ Helena...Strung together a season-long 8-game hit streak from Aug. 31-Sept. 8, batting .424 (14-for-33) with 4 doubles, 2 homersand 10 RBI...Connected for a grand slam on Sept. 8 vs. Billings and finished 2-for-4 with a double, run scored and a season-high 6RBI. December 5, 2018 Arizona Diamondbacks traded 1B Paul Goldschmidt to St. Louis Cardinals for C Carson Kelly, RHP Luke Weaver, 2B Andy Young and Future Considerations. September 28, 2014 Arizona Diamondbacks activated 1B Paul Goldschmidt from the 15-day disabled list. August 1, 2011 Arizona Diamondbacks selected the contract of 1B Paul Goldschmidt from Mobile BayBears. April 4, 2011 Paul Goldschmidt assigned to Mobile BayBears from Visalia Rawhide. January 19, 2011 Arizona Diamondbacks invited non-roster 1B Paul Goldschmidt to spring training. April 5, 2010 Paul Goldschmidt assigned to Visalia Rawhide from Missoula Osprey. April 1, 2010 1B Paul Goldschmidt assigned to Arizona Diamondbacks. June 22, 2009 Paul Goldschmidt assigned to Missoula Osprey from Arizona Diamondbacks. June 20, 2009 Arizona Diamondbacks signed Paul Goldschmidt.